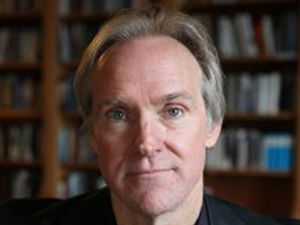 The Raymond Carver Reading Series in the College of Arts and Sciences continues with a reading by acclaimed poet, essayist and dramatist Tom Sleigh. On Wednesday, Sept. 30, Sleigh, who is this semester’s Leonard and Elise Elman Visiting Writer, will participate in an audience Q&A session at 3:45 p.m., followed by an author reading at 5:30 p.m. Both events are free and open to the public, and take place in Gifford Auditorium. For more information, contact Sarah Harwell G’05, associate director of the M.F.A. Program in Creative Writing, at scharwel@syr.edu. Sleigh is the author of eight books of poetry, including “Station Zed” (Graywolf Press, 2015), which weaves together elements of history, mythology and autobiography to create a collection that Publishers Weekly calls “personal and prophetic.” His other books include “Army Cats” (Graywolf Press, 2011) and “Space Walk” (Houghton Mifflin Harcourt, 2007), winners of the prestigious John Updike and Kingsley Tufts awards, respectively. Sleigh’s prose and poetry are widely anthologized, and regularly appear in many mainstream publications, including The New Yorker and The Atlantic. His work has been characterized as “gritty and challenging” (The Washington Post), “indispensable” (The Boston Globe), and “hard-earned and well-founded” (the late poet Seamus Heaney). Sleigh is a Distinguished Professor in the M.F.A. Program in Creative Writing at Hunter College of the City University of New York. He earned an M.A. from Johns Hopkins University.